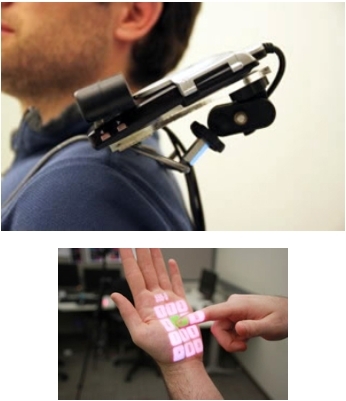 PITTSBURGH—OmniTouch, a wearable projection system developed by researchers at Microsoft Research and Carnegie Mellon University, enables users to turn pads of paper, walls or even their own hands, arms and legs into graphical, interactive surfaces. OmniTouch employs a depth-sensing camera, similar to the Microsoft Kinect, to track the user's fingers on everyday surfaces. This allows users to control interactive applications by tapping or dragging their fingers, much as they would with touchscreens found on smartphones or tablet computers. The projector can superimpose keyboards, keypads and other controls onto any surface, automatically adjusting for the surface's shape and orientation to minimize distortion of the projected images. "It's conceivable that anything you can do on today's mobile devices, you will be able to do on your hand using OmniTouch," said Chris Harrison, a Ph.D. student in Carnegie Mellon's Human-Computer Interaction Institute. The palm of the hand could be used as a phone keypad, or as a tablet for jotting down brief notes. Maps projected onto a wall could be panned and zoomed with the same finger motions that work with a conventional multitouch screen. Harrison was an intern at Microsoft Research when he developed OmniTouch in collaboration with Microsoft Research's Hrvoje Benko and Andrew D. Wilson. Harrison will describe the technology on Wednesday (Oct. 19) at the Association for Computing Machinery's Symposium on User Interface Software and Technology (UIST) in Santa Barbara, Calif. The OmniTouch device includes a short-range depth camera and laser pico-projector and is mounted on a user's shoulder. But Harrison said the device ultimately could be the size of a deck of cards, or even a matchbox, so that it could fit in a pocket, be easily wearable, or be integrated into future handheld devices. "With OmniTouch, we wanted to capitalize on the tremendous surface area the real world provides," said Benko, a researcher in Microsoft Research's Adaptive Systems and Interaction group. "We see this work as an evolutionary step in a larger effort at Microsoft Research to investigate the unconventional use of touch and gesture in devices to extend our vision of ubiquitous computing even further. Being able to collaborate openly with academics and researchers like Chris on such work is critical to our organization's ability to do great research — and to advancing the state of the art of computer user interfaces in general." Harrison previously worked with Microsoft Research to develop Skinput, a technology that used bioacoustic sensors to detect finger taps on a person's hands or forearm. Skinput thus enabled users to control smartphones or other compact computing devices. The optical sensing used in OmniTouch, by contrast, allows a wide range of interactions, similar to the capabilities of a computer mouse or touchscreen. It can track three-dimensional motion on the hand or other commonplace surfaces, and can sense whether fingers are "clicked" or hovering. What's more, OmniTouch does not require calibration — users can simply wear the device and immediately use its features. No instrumentation of the environment is needed; only the wearable device is needed. The Human-Computer Interaction Institute is part of Carnegie Mellon's acclaimed School of Computer Science.